View More In Outdoor Fryers & Smokers. - The unique design takes up very little space on you grill grates. - Lightweight, durable, portable, easy to use and clean. - Excellent heat-resistance and wear-resistance to last for a long time. 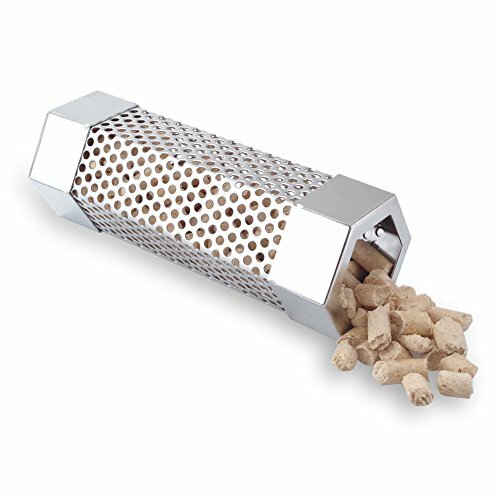 - It produces smoke for up to 2 hours during cold smoking. - If you're not satisfied with your purchase, please contact our custumer support and we promise a satisfying solution for you. Best Choice and Best Price, Get Them and You Will Not Be Disppointed! "ADD TO CART" Now! BUILT TO LAST - Made of 100% stainless steel, will never break, bend or rust easily. Only weighs 5.2oz. SLOW ROASTING - With a length of 6", it produces smoke for up to 2 hours during cold smoking. IMPROVED DESIGN - The hexagon design easily prevents the smoker from rolling around the grill grates to provide better and safer smoking effect. BEST CHOICE - Works with any electric, gas, charcoal or pellet grill. Smooth surface, easy to clean. 100% SATISFACTION GUARANTEE - If you're not satisfied with your purchase, please contact our custumer support and we promise a satisfying solution for you. If you have any questions about this product by KampFit, contact us by completing and submitting the form below. If you are looking for a specif part number, please include it with your message.